Vatna is a pre-wedding ceremony to cleanse and purify the bride and the groom. 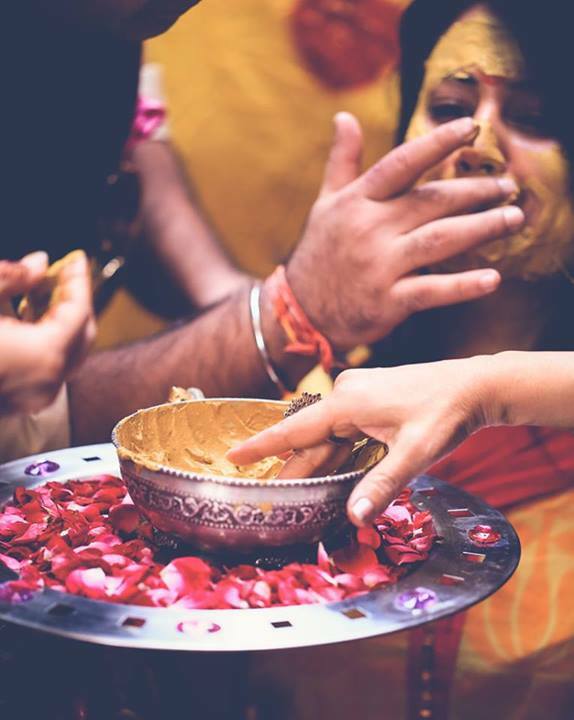 This is a ritual in which a paste consisting of turmeric and mustard oil is applied to the bride and groom’s face, hands and legs. It is a pre-wedding ritual that is performed post the Chuda ceremony. During this ritual, four diyas (lamps) are lit and the bride is made to sit in front of them. The lamps would be made to burn continuously as it is considered to be auspicious. The light emitted from the diya reflects on the bride’s face and her face would glow brightly. A colorful rangoli is also laid out in front of the place where the bride would sit. This will be for decorative purpose while bringing good luck too. Then, cousins and friends (only girls) apply vatna on the bride’s body. This paste is also known as Uptan which adds a natural glow to the skin. The turmeric acts like a scrub making the bride’s body BEAUTIFUL and radiant. Moreover, this is believed to purify her. In Sikh weddings, this ceremony is performed by applying the paste of turmeric, sandal and rosewater instead of mustard oil. The bride is then cleansed under the shade of Bhag, which is a phulkari worked cotton cloth that is passed through generations. This is also performed at the bridegroom’s house. Traditionally, the bride and groom would not leave their homes after this ceremony until their wedding.